Adding injury to insult, the Milwaukee Brewers placed Joakim Soria on the 10-day disabled list Friday, a day after he had to come out of a game after he allowed a go-ahead grand slam. Soria entered in the ninth inning with the bases loaded and none out in the Brewers’ loss to the Padres. He got Eric Hosmer on a short fly to right field but then Hunter Renfroe hit a home run, with Soria straining his right thigh in the process. 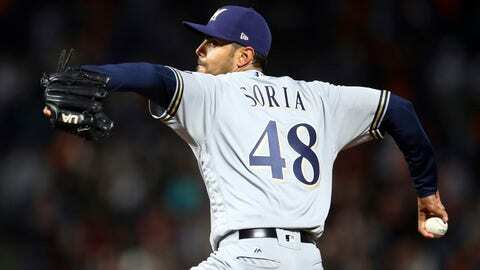 Acquired by Milwaukee on July 26 from the Chicago White Sox, Soria has pitched in 5 2/3 innings over seven games with the Brewers, allowing two runs (one earned) on four hits and three walks with six strikeouts. Taking Soria’s place on the roster is right-hander Adrian Houser, who was summoned from Triple-A Colorado Springs. This will be Houser’s fifth stint with the Brewers this season, owning a 4.09 ERA over 11 innings.